A north-east MSP has raised concern over moves to ban tractors from the new Aberdeen bypass. Scottish Conservative Peter Chapman has written to Transport Scotland to seek clarity after local officials suggested that the Aberdeen Western Peripheral Route would be granted “special road” status, which would mean agricultural vehicles are excluded. The issue was highlighted by farming industry body NFU Scotland during a round table discussion at the New Deer Show last weekend. Farmers are concerned that they will have difficulty transporting livestock, particularly those looking to make the journey from Ellon to the other side of the city at Portlethen. Mr Chapman said there is also the question of increased greenhouse gas emissions from agricultural vehicles being forced to travel through the city rather than using the new western peripheral route. Peter Chapman, Scottish Conservative MSP for the north-east region, said: “Farmers are up in arms about this. From the correspondence I have seen, it would appear the AWPR will be given special road designation, meaning tractors won’t be allowed. “My view is that this road is not a motorway, it is a dual carriageway and therefore tractors should be permitted to travel along the route. “If not, we will be forcing agricultural vehicles through the middle of Aberdeen, which does nothing for efficiency, congestion or our greenhouse gas emissions. 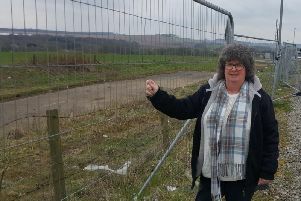 Iain Taylor, Scottish Conservative councillor for Turriff and District, added: “This is a big issue for farmers based north of Aberdeen who are hauling cattle to Portlethen for slaughter and also for contractors doing work over a large area.